This history has lead us to the weekend of September 4th, 2015 when the first official book about what happened after Return of the Jedi was released. Star Wars: Aftermath replaces Heir to the Empire as Star Wars gospel, giving fans their first taste of the aftereffects of the Rebel victory at Endor and the state of the universe in the wake of Vader and the Emperor’s death. For many fans, even though there have been other books in the new canon, this is the one they have been looking to as the “official” start since it begins them on the Journey to Star Wars: The Force Awakens. Can the book live up to these expectations? The plot is relatively simple. As the Empire scrambles to hold on to systems in the aftermath of the destruction of the second Death Star, a secret meeting is held on the outer rim world of Akiva. Wedge Antillies, on a reconecesne vacation, stumbles upon the meeting and is captured. At the same time Rebel pilot Norra Wexley has retured to Akiva to bring her son back with her to Chandrila, the home of the Senate of the New Republic. Mayhem ensues as Norra, her son Temmin, a former Imperial loyalty officer Sinjir and bounty hunter named Jas Emari join forces to rescue Wedge and destroy the Imperials. The book also features interludes that give glimpses to the state of the galaxy on different worlds, plus what can only be called miniscule cameos of Leia, Han, Chewie, Mon Mothma and Admiral Ackbar. One of the strongest points of this novel is its unification of the Star Wars universe from the Prequels to the Originals. Wendig deftly weaves the two parts of the Saga together seemlesly. So for fans worried that the Prequels would be forgotten, at least here, they play a wonderful supporting role for character back stories as well as the feel of the universe. It’s nice to have the Prequels feel respected and important in the new canon. Wendig tries to capture the ambiance of Star Wars in the dialogue and in the characters. Sometimes he captures it and sometimes he does not. There may be too many instances of Imperial officers yelling at Rebels, “scum” but that’s to be forgiven. On a whole, the new characters are good and they all feel like they fit right alongside any of the characters from any part of Star Wars. The major issue with the story is that it feels like the background to what should be the main story. The interludes hurt the book by the reminding you that the story you want to read with Leia, Han, Chewie and Mon Mothma is happening, just not in this book (Poor Luke is only a reference). Honestly there is just no excuse to not be following the major characters from the Orginal trilogy at this point. Star Wars has always been from the point of view from the main characters and any side character (on screen that is) has a relationship with a major character to help you understand their place in the Saga. A prime example of this is Star Wars Rebels and the way it has used, Tarkin, Vader and Ahsoka to give us a context for why characters like Kanan, Hera and Ezra are important to the overall story of Star Wars. In Aftermath, there is none of that. We’re never left with any other feeling other than this is a minor story that amounts to little more than a footnote in galactic history. 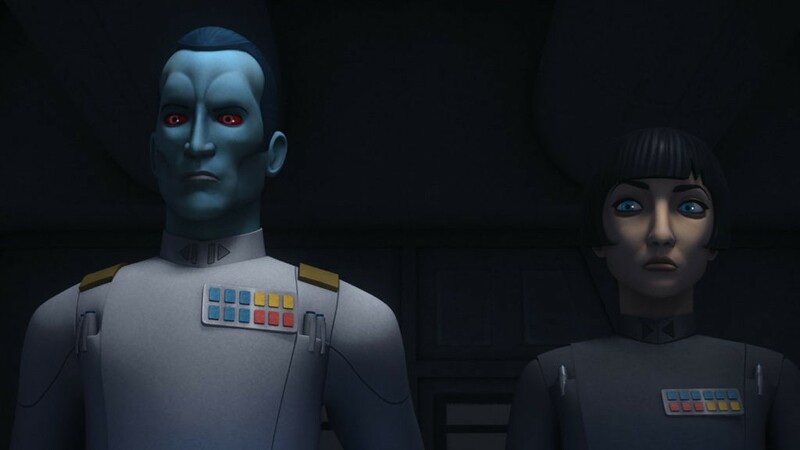 SPOILERS: The very end of the book does tease us with a shadowy Imperial admiral that feels similar to a Thrawn-type character. If you are going to have the books, comics and games be canon they need to have weight. People need a reason to read or play, so make the stories important and not just filler. Agents of S.H.I.E.L.D. has suffered with this very issue, so please be careful to not allow this to happen with the these Star Wars properties. The fun of the now Legends line, were the big, galaxy altering events that took place. Just because there are new films or shows does not mean readers and gamers don’t want meat to the stories, something that matters. Aftermath, like Tarkin and Heir to the Jedi all fail this test. Sadly the book never rises above feeling like filler, the light beer of Star Wars books. The real saving grace with Aftermath is that Wendig is a decent writer who is able to transcend the material enough to make this a weak recommend. Aftermath is rate 2.5 out of 5 lost A-Wings. This entry was posted in Book Reviews, Books, Star Wars, The Force Awakens and tagged Aftermath, Book Reviews, Books, Chuck Wendig, George Lucas, Journey to Star Wars The Force Awakens, Star Wars, Star Wars Expanded Universe, The Force Awakens, The Journey to Star Wars The Force Awakens, Timothy Zahn on September 7, 2015 by mrushing02.